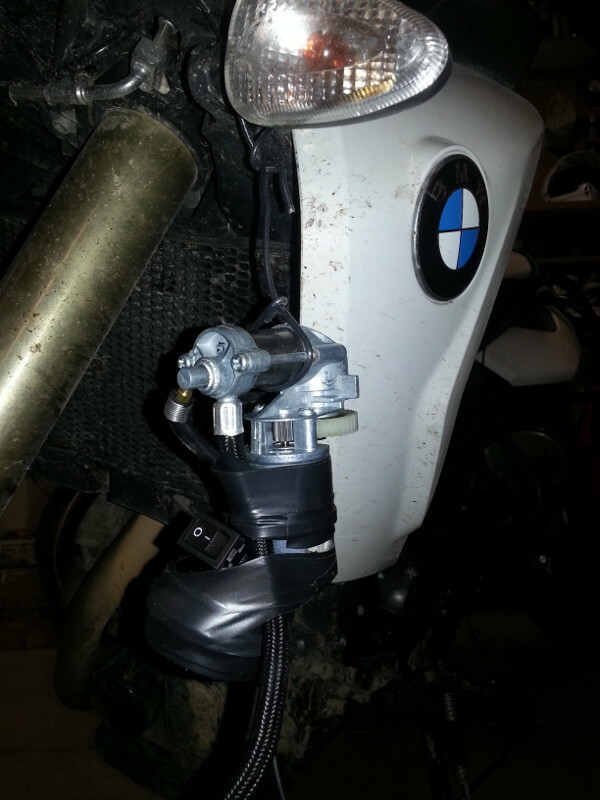 Preparing for a ride to Crater Lake on the F800GS…paring down my gear, modifying, eliminating. Last trip I had too much on the bike. Didn’t need most of it. What I did need was too bulky anyway. 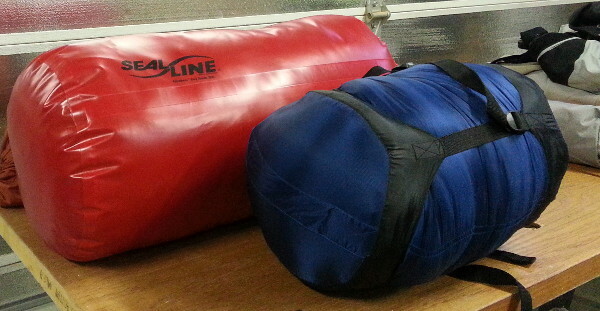 My 30°F Coleman Extra Large sleeping bag is in the red Seal Line drybag. Mellissa’s 30°F Coleman Regular sleeping bag is in the compression sack. Still not as compressed as I’d like, but a step in the right direction. ^^^The red bag and blue bag are even at the end, which shows that the blue bag is about half the length of the red and nearly three inches smaller in diameter. 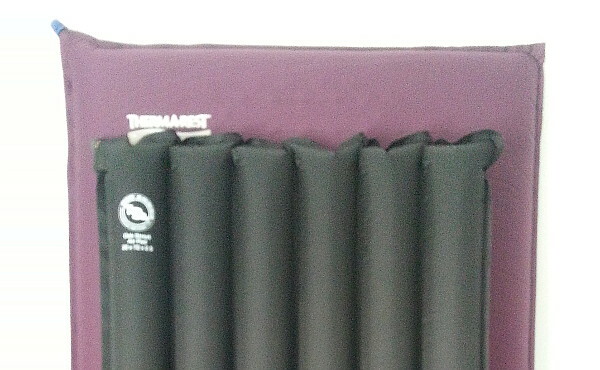 Purple bag: Thermarest Luxury Map 3-inch-thick self-inflating mattress. Black bag: Big Agnes Oak Street Air Pad 2.5-inch-thick air mattress. 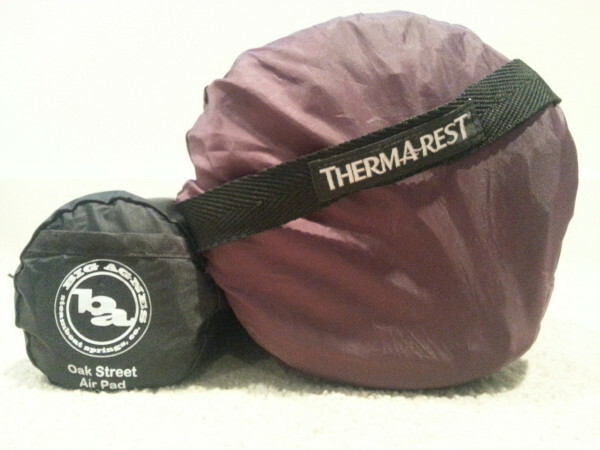 Thermarest is double diameter of the Big Agnes. Standing against the wall, Big Agnes is nearly as big as Thermarest. ^^^Found this Big Agnes Oak Street Air Pad on the shelf at REI for about $45. It took 20 deep breaths to fill it tight. I couldn’t get any more air into it. Mellissa and I tried it briefly and both gave it a thumbs-up for comfort. The real test will be camping at Crater Lake next week. The Thermarest mattress took 10 deep breaths after self inflation. We love our Thermarest Luxury Map pads, but they don’t pack down small enough for minimalist motorcycle touring. 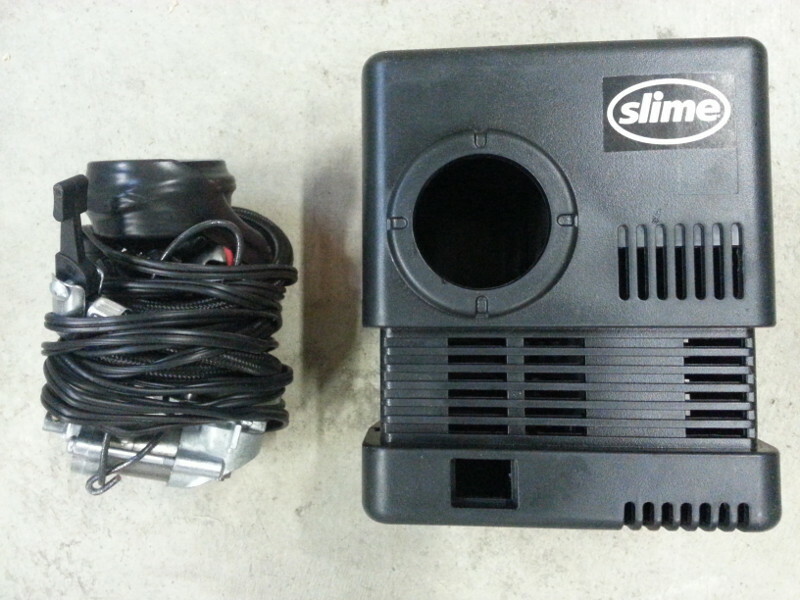 Got this Slime compressor for $10 clearance at Target. Very bulky so I gutted it. The gauge isn’t very accurate but it gives me a good idea of when to stop and check tire pressure with my good gauge. 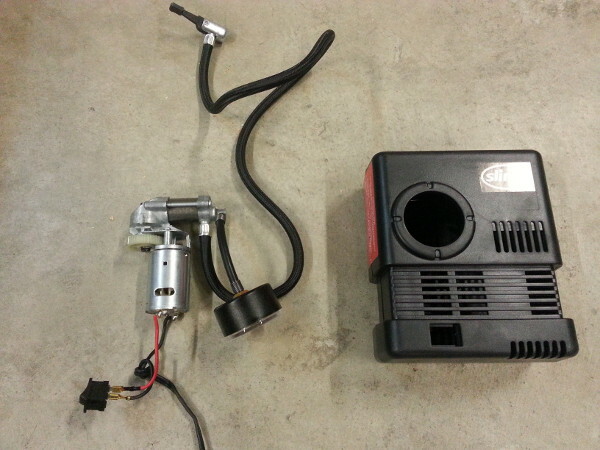 Modified compressor next to it’s empty housing. That’s about two feet of braided hose and ten feet of electrical wire wrapped around. I thought about chopping some length from the cord; however, better to have it and not need it than to need it and not have it. 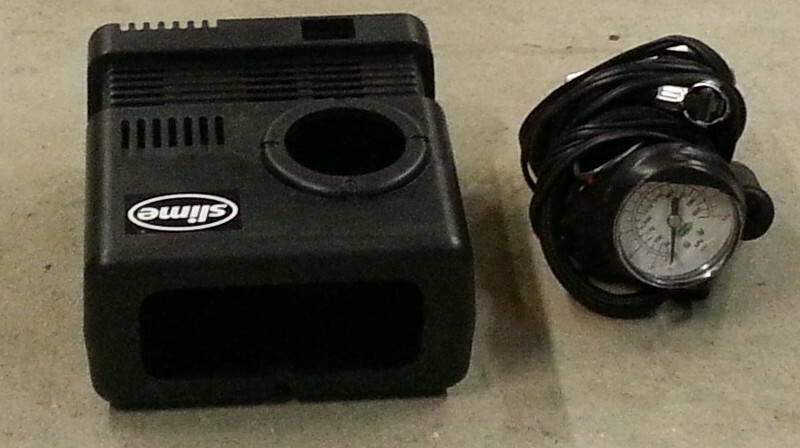 ^^^The compressor now fits into a sandwich-sized Ziploc bag. There are several moving parts exposed and the motor will get hot, so keeping this contraption out of the dirt and providing plenty of air movement will be key to its survival. 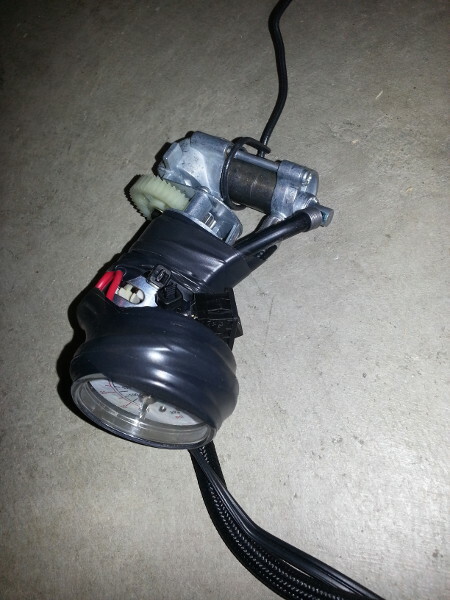 I have used this pump to inflate a motorcycle tire. It took about 15 minutes. Had to let the motor cool down a couple times. Obviously this pump is for emergencies only. Hopefully it will never be used again. I’ve ticked down my master packing list and eliminated tons of stuff. Will upload some details tomorrow. Still researching highly-compressible sleeping bags and solo tents. Had considered taking the hammock instead of tent but saw some recent posts about mosquitoes wreaking havoc at Crater Lake through the end of July or later. This entry was posted in Motorbike, Motorcycle, Travel and tagged adventure, Big Agnes, BMW, camping, Compressor, Crater Lake, F800GS, Gear, Hiking, luggage, mod, modification, motorbike, motorcycle, National Park, Oregon, Outdoor, Photography, Pump, Samsung Galaxy S3, Tent, Thermarest, travel. Bookmark the permalink.